Rivendell 14 ~ Bilbo’s Gifts III: Bilbo transformed, plus Pt. 7 of jan-u-wine's 'Rivendell Suite'. Note: Contains extended reflection on scene, not really a rant, but expressing complaints. Also has nice caps, book excerpt and great poem. I don't like the turn the scene takes in its second half and that's a fact. It's not that the scene doesn't work well as drama. It does. But I don't like how it affects the "character arcs" of the two hobbits, and I don't like how it alters a favourite feature in Tolkien's story. It's not really because the adaptors moved the scene from its place in the book. I would not have moved it -- the moment when Frodo sees Bilbo as strange and frightening -- to the eve of his departure for the Quest. But, for the sake of compression (the time spent at film-Rivendell appears to be quite brief), the relocation works well enough. What I dislike is the way they decided to portray the transformation. In the book, it is not completely clear whether Bilbo actually is behaving oddly or if Frodo's perceptions have been altered by the Ring. This ambiguity runs throughout LotR. Tom Shippey discusses it in interviews for the EE extras for FotR, and at greater length in Road to Middle-earth and Author of the Century. The Ring's evil works both from the inside and the outside. It operates as an "amplifier" of tendencies or weaknesses already present in a character. Shippey uses the changeable weight of the Ring as one example. In "The Shadow of the Past", when asked by Gandalf to produce it, Frodo feels the Ring as suddenly heavy in his hand. Is it really heavy, or does Frodo merely sense it as heavy? It would be the Ring acting as an amplifier if it were merely a matter of perception: the heaviness a subjective experience, showing that Frodo was becoming attached to it and was reluctance to part with it. But the evil of the Ring is also portrayed exerting its influence objectively, an external power. Thus the Ring is also portrayed as objectively heavy. It is not just Frodo's perception, because Sam can see that the Ring-weighted chain has cut a bloody groove in Frodo's neck. Frodo experiences the conscious call of Ring internally and externally, too. It speaks to him from within, seductively, making him itch to put it on, by amplifying his desire for it to a fever pitch. But it also calls to him from without, bringing pressure to bear against him as an alien force, demanding he put it on, demanding he submit. As early as the Emyn Muil the fiery Ring vision beats upon Frodo's brow and hammers against his mind like the battering rams against the gates of Helm's Deep and Minas Tirith. Frodo is thus assailed from within and without. 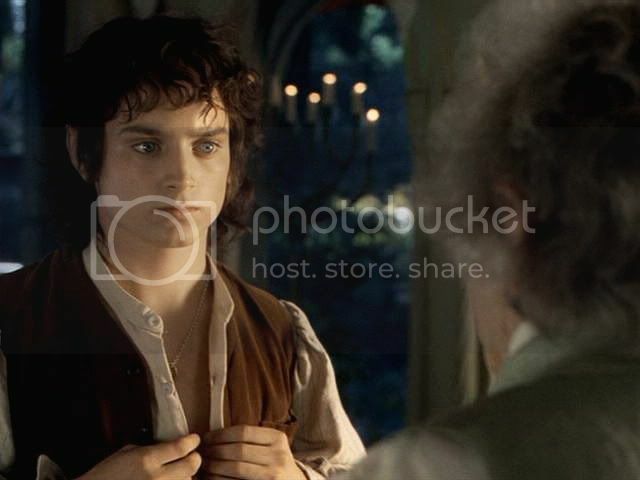 In the scene in which Frodo has his alarming vision of Bilbo, the scene screencapped here, the Ring could be seen as operating in either of these two ways, as an external power or an internal amplifier. Does Frodo actually see Bilbo suddenly so overcome with Ring-lust that he undergoes a complete character transformation, trying to wrest the Ring from Frodo by force? 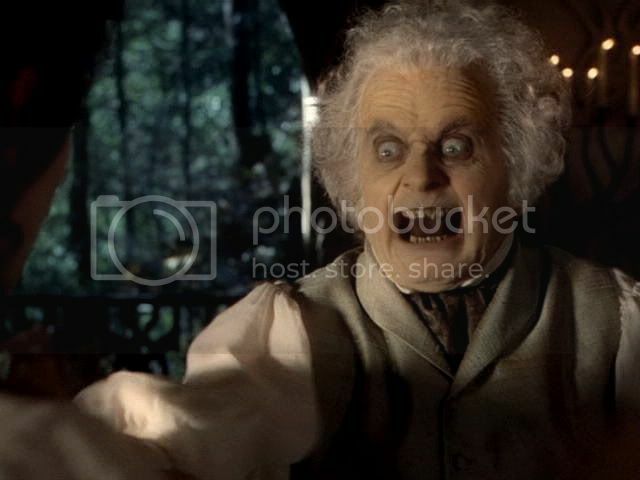 That would show the Ring operating as an external force, transforming Bilbo's character into something Ring-possessed. Or is the Ring amplifying Frodo's own Ring-lust? If it merely tapping into and exposing his own desire that the Ring has quietly brought to such a pitch (given a dose of Miracle-Gro by the point of the Witch-king's blade)? In that case, the grasping creature is the product of Frodo's Ring-warped perceptions. Or, both dynamics could be going on in the scene: perhaps there really was an unwholesome glint in Bilbo's eye (Ring operating as external force), and that glint evoked Frodo's subjective vision of Bilbo as monstrous (Ring as internal amplifier). I suppose the filmmakers thought it would be too difficult to preserve this ambiguity and felt the need to play it one way or the other. And they chose to show the Ring operating as an external force. In the scene, we see suddenly-kindled desire for the Ring make Bilbo crazy, which alarms and terrifies Frodo. Bilbo is reduced to a state of pitiable, shamed remorse for having put Frodo through such an awful experience, and Frodo comforts him. As I said, the scene works. Wretched Bilbo elicits our sympathy, Frodo our love (for being so sweet), and PJ gets to indulge his love for horror movies. And Brian Sibley might have set a precedent. As evidenced by the interviews in the DVD Extras, and his work on the film-related books, Brian Sibley was an important influence during the production, even if he was not an official employee. In Sibley's very fine adaptation of LOTR for BBC radio made in the 1980's, he wrote this scene the same way: Bilbo actually becomes grasping and frightening, and Frodo responds with alarm and distress. PJ follows some other adaptation choices Sibley made, so maybe this was another one of them. Personally I'm sorry the filmmakers made this decision. It's not just a matter of fidelity to the book scene, but to the larger theme of the ambiguity of the way the Ring works. 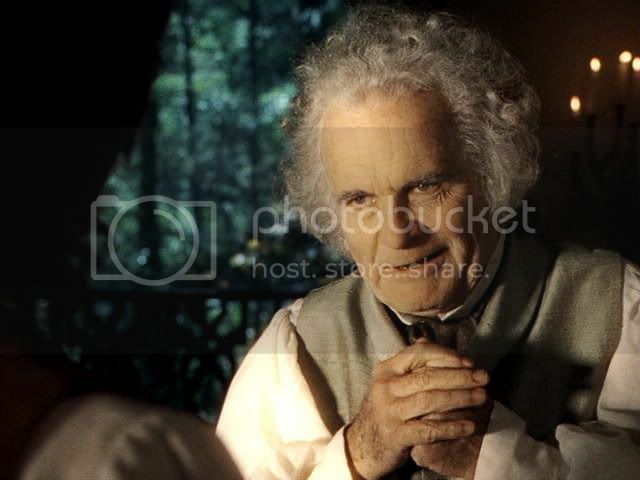 I think of the difficult Ring-shadowed moment between Frodo and Bilbo as a foretaste, a foreshadowing of what will come: Frodo assailed by the Ring from within and without. Specifically I think it foreshadows the scene in the Tower of Cirith Ungol, when Sam, having just rescued Frodo, reveals that he's still got the Ring. I think what happens there, perhaps one of Frodo's bitterest experiences on the Quest, is the amplification of what has already happened in Rivendell. 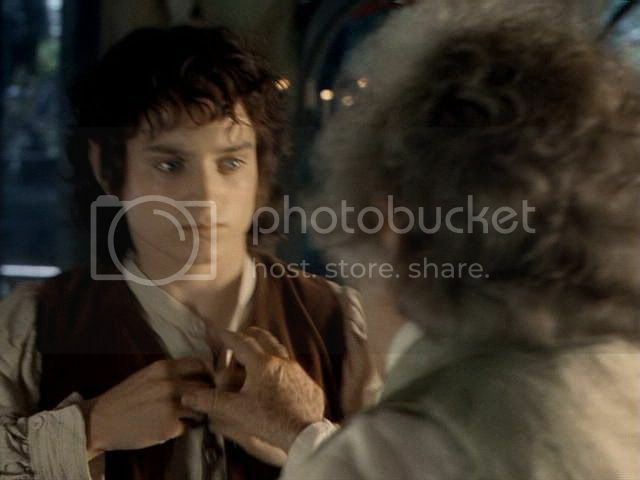 Sam tells Frodo he's saved the Ring, but hesitates, feeling a reluctance to let the Ring go, "now it had come to it". This makes me think Bilbo probably did have a glint in his eye, the thing that set Frodo off. When Sam doesn't give Frodo the Ring immediately, "quickly and strangely his tone changed". Frodo demands it back, finally snatching it and calling Sam, "thief! ", his "eyes wide with fear and enmity". ...[H]e stood aghast. A mist seemed to clear from his eyes, and he passed a hand over his aching brow. The hideous vision had seemed so real to him ... Sam had changed before his very eyes into an orc again, leering and pawing at his treasure, a foul little creature with greedy eyes and slobbering mouth. But now the vision had passed. My complaint is not just that the filmmakers made Bilbo monstrous when he ought not to have been, but that they threw away the opportunity to show what the Ring was doing to Frodo -- what it was already doing before the Quest even started -- and what it would continue to do, exponentially. 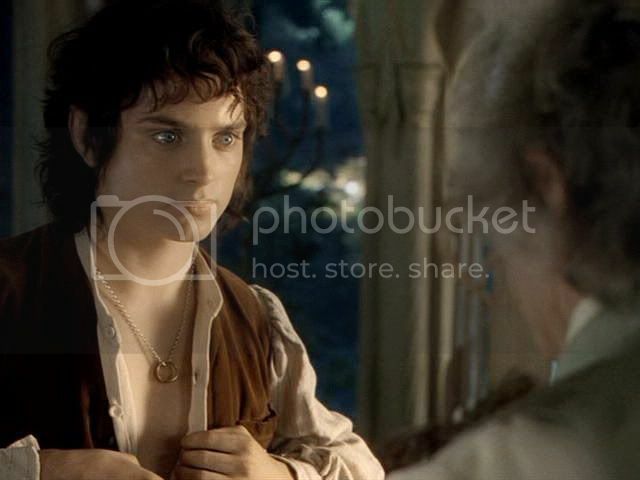 In Rivendell, Frodo feels a "strange reluctance" to produce the Ring when asked. A shadow seems to fall between them, we are told, and through it Frodo finds himself eyeing Bilbo as a little wrinkled creature with a hungry face and bony groping hands. Note that Frodo sees Bilbo through the shadow that falls between them, just as he sees Sam in Cirith Ungol through a mist. With his perceptions clouded and distorted by the Ring, Frodo sees Sam as a full-fledged orc. Yet another detail is lost by the filmmakers' treatment of the Rivendell film scene, which is Frodo's enmity towards Bilbo. Frodo's reaction to grasping and greedy Bilbo in the book is not described as fear, which is primarily what Frodo shows in the film scene. "He felt a desire to strike him", is what we read. That shows real enmity, not just alarm or fear. After Cirith Ungol, when Frodo and Sam are on the plains of Gorgoroth, Sam again offers to carry the Ring and Frodo goes wild. "Stand away! Don't touch me!" he screams, and "his hand strayed to his sword-hilt". It's only a few paragraphs later that Frodo throws away his sword. "I'll be an orc no more," he cries, flinging off his orc-gear. For what is an orc, at least in these last chapters in the Tower and Pass, but someone who kills his friends fighting over the swag? It is too beastly, even when the swag is the Ring. Thus he'll "bear no weapon, fair or foul". Frodo has not forgotten what he almost did, and still might do. In the meantime, enjoy the screencaps and, particularly, enjoy jan-u-wine's entry in her ongoing Rivendell Suite series. The new poem, which appears after the images, is written from Frodo's perspective, and preserves well the ambiguous way the book portrays the workings of the Ring. Book scene: from Many Meetings. ‘Fancy that ring of mine causing such a disturbance! It is a pity that Gandalf did not find out more sooner. I could have brought the thing here myself long ago without so much trouble. I have thought several times of going back to Hobbiton for it; but I am getting old, and they would not let me: Gandalf and Elrond, I mean. They seemed to think that the Enemy was looking high and low for me, and would make mincemeat of me, if he caught me tottering about in the Wild. ‘And Gandalf said: “The Ring has passed on, Bilbo. It would do no good to you or to others, if you tried to meddle with it again.” Odd sort of remark, just like Gandalf. But he said he was looking after you, so I let things be. I am frightfully glad to see you safe and sound.’ He paused and looked at Frodo doubtfully. ‘Have you got it here?’ he asked in a whisper. ‘I can’t help feeling curious, you know, after all I’ve heard. I should very much like just to peep at it again. ‘Well, I should just like to see it for a moment,’ said Bilbo. When he had dressed, Frodo found that while he slept the Ring had been hung about his neck on a new chain, light but strong. Slowly he drew it out. Bilbo put out his hand. But Frodo quickly drew the Ring back. To his distress and amazement he found that he was no longer looking at Bilbo; a shadow seemed to have fallen between them, and through it he found himself eyeing a little wrinkled creature with a hungry face and bony groping hands. He felt a desire to strike him. Frodo hid the Ring away, and the shadow passed leaving hardly a shred of memory. The light and music of Rivendell was about him again. Bilbo smiled and laughed happily. Every item of news from the Shire that Frodo could tell—aided and corrected now and again by Sam—was of the greatest interest to him, from the felling of the least tree to the pranks of the smallest child in Hobbiton. Bilbo: Oh! I should very much like to hold it again, one last time. it is all I may never know again. *also known as "The Swordsman of the Sky", this is the star group that appears as Frodo encounters Gildor and his company in the Woody End upon his departure from the Shire. This star grouping had a huge signifcance for the Elves: placed in the night sky by Elbereth, it symbolizes eternal guardianship (from the evil of Melkor) of the World, even unto the Last Battle. Source: Encyclopedia of Arda (Menelvagor). **Another in the pantheon of stars, it made its appearance soon after Eärendil and Elwing departed across the Sea. In reality, its light was that of the Silmaril which Eärendil had bound upon his brow. The rising of this star was taken by the Elves as a sign that the Valar yet cared about the fate of the Outer Lands. The name "Gil-Estel" means "Star of Hope". ~ Riv. 13: Bilbo’s Gifts 2 – The mithril shirt. ~ Riv. 15 – Bilbo's remorse, plus jan-u-wine's 'Rivendell Suite Pt. 8'. Yes, they did beautifully, the actors. Well, everyone involved except the screenwriters. Although, having read Sibley's account of the the pre-production and production period for the films in Sibley's book on Peter Jackson, I marvel that the films are as brilliant and well-done as they are. When I bear in mind the kind of pressure they were under, in terms of time and in terms of powerful voices urging, even demanding that they do this or that with the script, I am undyingly grateful for what they *did* do. Thanks, Luthien. Where do you get all your spare time, you still in school full time? I admire -- and covet! -- your energy and passion to create. In the book, it is not completely clear whether Bilbo actually is behaving oddly or if Frodo's perceptions have been altered by the Ring. So true. It's these ambiguities that make writing fanfic so fascinating. So much can be interpreted in different ways, and still be true to canon. Yes, the ambiguities are essential to appreciating the book to its fullest, AND its longest, since they make it the sort of book it is -- one that fans can read and read and read (and authors write about) and never exhaust. > My complaint is not just that the filmmakers made Bilbo monstrous when he ought not to have been, but that they threw away the opportunity to show what the Ring was doing to Frodo -- what it was already doing before the Quest even started -- and what it would continue to do, exponentially. So true. I felt the filmmakers sabotaged the characters as I had come to love them through the books. The films were gorgeous, pretty-- but the appreciation of character wasn't there, alas. Good grief! You're supposed to be saving your time and stamina to write fiction (when not earning a living), not hanging around in LJ's, Mariole. Naughty, naughty, naughty! But it's good to see you. Well, I always liked the films better than you did, Mariole, (if I recall your posts), but as time goes on I've been getting the distance to try and better understand why, in particular, I have felt confused, angry or disappointed by a certain choice. I've found that interesting, and often illuminating about the book -- why this or that theme or detail is important to me, and why it made a difference when it was tampered with. I don't entirely agree with your analysis of the film scene. Since film is a visual medium, and also the films had to appeal to those who had not read the book, it was necessary in general to portray the ring's evil influence as an external force. As for enmity in Frodo - in this scene I would say he shows, before Bilbo's transformation but when Bilbo asks for the ring, not exactly enmity but some hostility (these caps make that clearer). I don't think his expression, before the transformation, indicates fear. 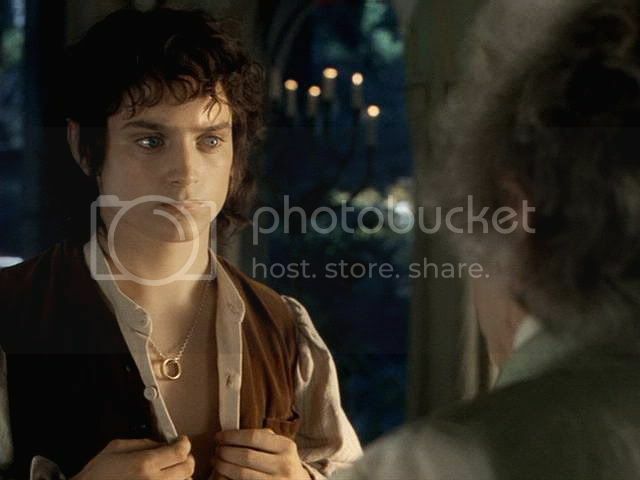 The idea that the ring induces enmity is captured in the scene when Frodo abandons Sam due to ring lust - he abandons him because Sam asks to carry the ring. 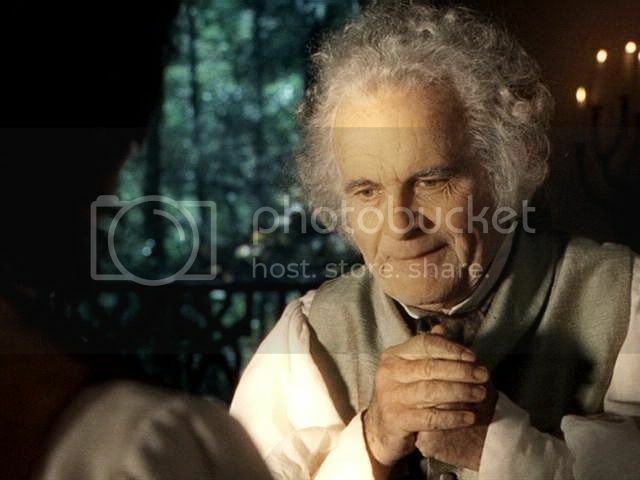 Of course that is a change from the book, but it is thematically reasonably authentic due to the passage in Rivendell you mention, and other passages, in which Frodo sees Sam through a vision that is affected by the ring. In fact in the scene where he abandons Sam the ring is scene as operating as an internal not an external force, since the film audience is intended to sympathise with Sam and to realise that Frodo is being affected by the ring. I agree however that the idea that the ring was already affecting Frodo at Rivendell is not fully portrayed; I think it is subtly portrayed to an extent - eg his wince when Gimli tries to destroy it in the Council scene and his hostility to the idea of Bilbo holding it here. You argue well! That is the best justification for the "go home, Sam" scene I've read yet, in so far as it manages to relate that controversial scene to actual book material. It makes sense, not as a scene from the Stairs, but as a reworking of the Tower scene, when Frodo sees Sam as an orc, that they didn't use (since they wrote a new Tower scene). Just as I suppose the scene in which Frodo holds Sam at swordpoint in Osgiliath could be seen as a transposition of the one on Gorgoroth, when Frodo's hand "strayed to his sword-hilt" after Sam again asked for the Ring. Of course, in the book Frodo never went to Osgiliath, and still had incredible command of himself at that point in the story. And, in the book, although he clearly had an impulse to repell Sam violently on Gorgoroth, he did not actually do it, even though he was in a terrible state by then. I think your leading point explains both these choices, even if I didn't like it: that they needed to show the Ring as an external power - thus capable of producing these extreme (thus visible to the audience) behaviours was the deciding factor. And I agree Frodo's expressions in this series are, well, not what I'd call enmity (especially while the scene is in motion), but they are very cool, very "Not, Bilbo". The caps in the next and last part show Frodo's reaction more fully. The cap where I left off was the split second before he pulls away. Thanks for a thoughtful, passionate argument. Yes, they probably both were perceiving things oddly at this point. I guess it's a matter of such a strong emphasis, so that the ambiguity was lost. And three cheers for the Unbuttoning of the Shirt. Yeah, really, the unbuttoning of the shirt takes all. :) Oh, how I'd love to read a new, het, and deliciously hot fic about some unbuttoning of Frodo's shirt! Was that you, White Gull? 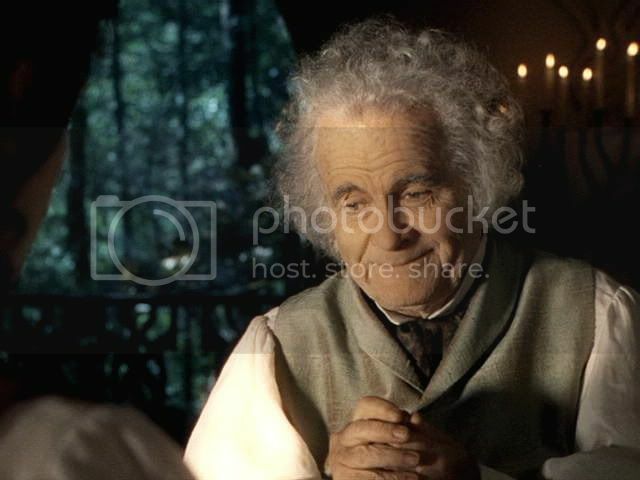 I was interested in your perceptions of the meaning of the ring's influence upon Bilbo and Frodo in that scene and hadn't realised the importance of it until you pointed it out. Elijah's and Ian's eyes and expressions both captured the ring's influence upon them both even before Bilbo turned momentarily 'orc' like. That moment made me jump out of my skin and it actually worked as a jolting reminder of the ring's evil. I felt so sorry for Bilbo and great sadness for Frodo because this is what his future would become.